Creek, stocked with largemouth bass, crappie, bluegill, perch and catfish, is about 13 miles west of Harrington. Boat launching and limited camping are available. This lake provides a quality angling and wildlife-viewing opportunity, with excellent fly-fishing. Upper Twin Lake is located in the Lake Creek drainage west of Harrington. This year round open season location has access provided by the Bureau of Land Management. 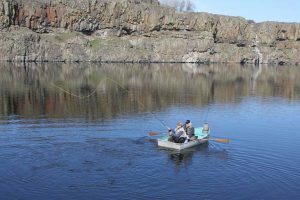 Upper Twin is stocked with fry and catchable-size rainbow trout, and also has good populations of largemouth bass and black crappie. Crab Creek/Goose Butte/Rocky Ford South of Harrington on the Harringon-Tokio (Hills) Rd. is BLM land access to a portion of Crab Creek. Not noted on many fishing maps, but trout fisherman seem to frequent the stream.